If you haven't already, go grab your Xbox 360 Dashboard update now. With it brings 1080p support over component and VGA, HD DVD player support, WMV streaming from WMP11, file playback from external storage, and much much more. Check out the big list of updates after the jump. HD 1080p video mode support over VGA and component cables. Xbox 360 HD DVD Player support. Stream WMV video from a Windows PC running Windows Media Player 11, Zune software, or Windows Media Connect. Play video from storage devices such as USB flash drives, Xbox 360 Memory Units, etc. Play video from CD or DVD data discs. Xbox 360 Wireless Headset support, including battery level indicator in the Xbox Guide. Video support for 50 Hz HDTV modes (DVD and HD DVD only). Xbox 360 Wireless Racing Wheel support. Set up automatic downloads of newly released Xbox Live Arcade trial games. Stream music, pictures and video from a Zune device. Lightning-fast enumeration and listing of all Xbox Live Arcade games on the console. Find games quickly with two new sort options: Recently Played and By Category. Have all new Xbox Live Arcade games at the ready with auto downloads. Auto downloads optionally adds newly released trial versions of games to active downloads when you enter Xbox Live Arcade. View full achievement info in Xbox Live Arcade, including icons, achievement point details, and descriptions. Friends leaderboard: Compare yourself with friends and view leaderboard details right from the Xbox dashboard. Tell a friend: Send a message to a friend about your newest favorite Xbox Live Arcade game. Optionally disable notifications from Xbox Live while watching DVD movies. Improved support for audio streams on incorrectly authored DVDs. Better handling of unreadable discs. Added zoom support for non-anamorphic content. Added support to Family Settings to block Unrated Content. Improved support for extended all black scenes in WMV content. Added support for Windows Media Video 9 Advanced profile video. Screen saver now becomes active when videos are paused. Now shares UI and player controls with DVD player. Improved video playback while downloading from Xbox Live. Added skip controls (forward approx. 30 seconds, back approx. 7 seconds). Improved messaging around unplayable video content. Added time elapsed and time remaining displays. Improved playback of high bit-rate HD content on fragmented hard drives. Improved visual quality of video playback. Added selectable display modes: default and letterbox zoom. New locale setting for China. Improved German translations in console settings. Improved German translations in memory area. Improved Japanese translations in Family Settings. Added localized text for all supported languages in pictures area. Improved Spanish translations in camera effects. Added localization support for title menu and main menu in the DVD player. Added localization support for "Attempting to Read Media" system message. Added support for Xbox 360 HD DVD Player content. Added new page for viewing content size by category. Updated support for new Daylight Savings changes coming in 2007. Improved support for games to better handle host migration in multi-player matches. Improved Xbox Live Vision camera support for changing room lighting while zooming. Background downloaded videos appear in video area. Improved Xbox Live Vision camera support while using VGA. Playing photo slideshows from PC now maintains picture folder hierarchy. Improved user experience when playing and deleting videos from the Games or Media areas. Improved handling of invalid characters during Xbox Live signup. Better handling of watermarks in gamer cards. Improved text for Windows Media Connect. Improved UI performance in Media Center Extender. Improved connection support for Buffalo WZR-G108 wireless router when using Xbox 360 Wireless Adapter. Redownload of deleted Arcade Games no longer re-enumerates all games on the Arcade page. Improved visual display of text in themes. Improved support for CD playback after signing up for Xbox Live and losing network connectivity. Improved support for long names of items memory area. Improved handling of gamer pictures downloaded from Xbox Live. Improved background download notifications when downloading many small items from Xbox Live. Improved support for custom backgrounds after returning to the Xbox Dashboard from the Account Management area. Improved network reliability between Windows Media Center Extender on Windows Vista and Xbox 360 consoles using Xbox 360 Wireless Adapter. Improved voice chat quality in Xbox Dashboard and in-game chats. Improved messaging when failing to connect to Windows Media Center Extender. Improved USB keyboard support when using a USB hub. Improved consistency of user experience when deleting various types of content. Improved handling of low storage space for background downloads. Improved error messaging for optional iPod support download when storage devices are full. Improved handling of multi-key repeating for USB keyboards. Expanded Family Settings to include support for blocking unrated DVDs and videos. Added ability to clear space from storage devices in download areas. Added support for low-speed and full-speed USB keyboards. Improved CapsLock behavior for USB keyboards. 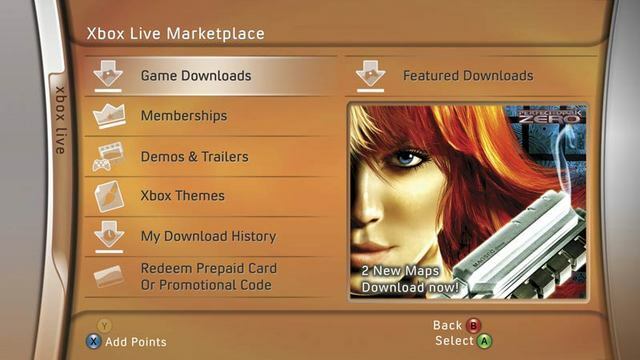 Improved look and feel in Xbox Live Marketplace and Xbox Live Arcade areas. Added redeem code option to Xbox Live signup. Removed system message at the start of new downloads. Messages will be displayed for completed items. Added support for CCV credit card validation field in Xbox Live Marketplace purchase areas. Updated "More Information" instructions in the Xbox Dashboard for connecting an Xbox 360 console to a Windows PC to stream digital media content. Added auto-scroll to long text descriptions in Xbox Dashboard UI. Improved support for DVD insertion while playing a video file.